In 1541, the Spanish explorer Francisco de Coronado, in 1541, was probably the first European to visit the area known today as Kansas. It became part of the United States in 1803 as a result of the Louisiana Purchase. 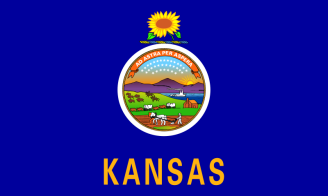 Kansas vital records are available from the Kansas Office of Vital Statistics. Birth records and death records are available for a fee, and with proper photo identification, dating from July 1911. Earlier records are available from the County Clerk in the county where the event occurred. Visit http://www.kdheks.gov/vital/birth_howto.html for more information on obtaining Kansas birth records. To find how to obtain certified copies, visit http://www.kdheks.gov/vital/birth.html. Visit http://www.kdheks.gov/vital/death_howto.html for more information on obtaining Kansas death records. To find how to obtain certified copies, visit http://www.kdheks.gov/vital/death.html. Note: Vital records are not considered public records in Kansas. Uncertified copies or verifications are not provided to the public. Birth certificates began being filed with the Office July 1, 1911. Record Access Requirements: Must have a signed release from person of record or have direct interest for personal or property right. You must also include photocopy of your government-issued photo ID (DL, for instance). Search Note: Pre-1940 records may be requested by an individual related as at least a cousin. Post 1940 records must be requested by an immediate family member. Note: Vital records are not considered public records in Kansas. Uncertified copies or verifications are not provided to the public. Record Access Requirements: Must have a signed release from immediate family member or show direct interest for personal or property right. You must also include photocopy of your government-issued photo ID (DL, for instance). Note: Please include a daytime phone number.